NOAA and its partner agencies often collect and maintain a large amount of data to document the location and extent of injuries to the environment. To determine impacts from an incident, samples may be taken from air, water, sediment, oil, even tissue from wildlife. Field teams may also record environmental conditions (e.g., water temperature, salinity, and oxygen levels) and visual observations (e.g., vegetation density, and wildlife counts, indicators of wildlife heath). 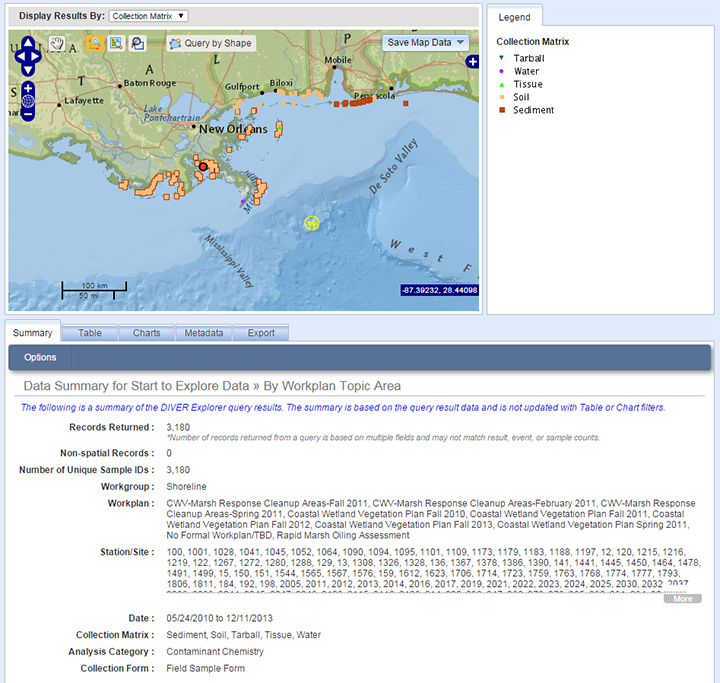 The DIVER (Data Integration, Visualization, Exploration, and Reporting) tool was developed by NOAA to support these natural resource damage assessment (NRDA) efforts. Visit DIVER Explorer. The DIVER application supports integration and distribution of NRDA assessment and restoration data, as well as historical data collected from hazardous sites around the country. It allows scientists from different organizations and laboratories located across the country to upload field data, analyses, photographs, and other key information related to their environmental impact studies in a standardized format. You can use the DIVER Explorer query tool, which allows users to search, filter, and download data. Query results are presented in an interactive dashboard, with a map, charts, table of results, metadata (data about the data), and several options for exporting data for mapping or further analysis. NOAA Builds Tool to Hold Unprecedented Amounts of Data from Studying an Unprecedented Oil Spill: Learn the behind-the-scenes story of how a NOAA team developed DIVER to gather and organize what would become an unprecedented amount of data generated from the Deepwater Horizon oil spill. NOAA discusses using big data techniques to make environmental datasets accessible to the public and scientific community Questions: Contact us with your questions, comments, or suggestions for DIVER.